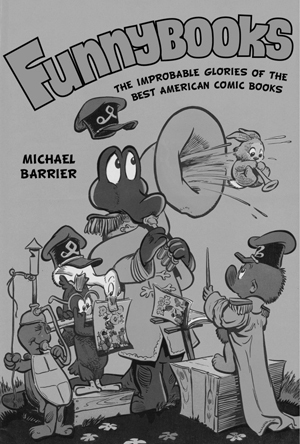 Today is the official publication date for my new book Funnybooks: The Improbable Glories of the Best American Comic Books. Exactly what "official publication date" means in my case, I'm not sure. I haven't seen another copy of the book since my advance copy arrived on November 5, and amazon.com still shows it as not available. I've been wondering lately just how available it will ever be. All authors are paranoid, but sometimes, as the saying goes, they really are coming to get you. It has now been more than eight months since I last heard anything from the person at University of California Press who is in charge of publicity for the book. My emails to her have gone unanswered. No one has ever asked me to suggest who should get review copies. This is in complete contrast to how UC Press managed such matters for my last book, The Animated Man: A Life of Walt Disney. I've always known that Funnybooks would appeal most strongly to a relatively small audience, but the people who care about its subject matter really care about it, and there are better ways to reach them than by using some standard list for review copies. That's assuming, of course, that there will even be review copies. Over the past year, whenever the size of the print run came up in my exchanges with people at UC Press, the figure bobbed around but always seemed to settle lower. 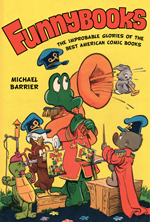 In the process, the planned initial release of Funnybooks as a standard hardcover, with dust jacket, fell away, replaced by simultaneous release of a trade paperback and an unjacketed hardcover, both bearing high prices for books of that type. I have no idea how many copies have now been printed, but that figure can't be very large. I've been trying for months to put the most optimistic possible construction on what the Press has been doing, and to be as cooperative as possible, especially since the actual production of the book—the editing, the design—has gone very well. Many people at the Press have done their best to make Funnybooks a handsome and appealing book, and they've succeeded. It's unfortunate that other people at the Press seem determined to fit it with concrete boots. What's happening with Funnybooks is probably an example of a recurrent phenomenon that Art Spiegelman and Françoise Mouly identified when they were interviewed by Chris Mautner of Comic Book Resources five years ago, about their wonderful anthology called The Toon Treasury of Classic Children's Comics. Mouly, who is the art director for The New Yorker, said: "I've had New Yorker editors—perfectly respectable, intelligent people—explain to me that, because children's literature is aimed at this specific age group, and the author takes into account the age of the reader, it can't possibly be anything other than genre literature because of those constraints." Spiegelman added: "Tell it to Lewis Carroll." Art gave me a great blurb for Funnybooks, but UC Press, true to form, buried it in a sea of gray type on the paperback's back cover, with no mention of his extraordinary Pulitzer Prize or his status as the cartoonist with the strongest literary/intellectual credentials. The back cover was the only page I did not see in page proof, even though I asked to see it specifically. My essential argument in Funnybooks is that the best comics for children, like the best children's books of other kinds, are worthy of repeated visits by adults who are otherwise reading books that are not accessible to children, by virtue of their vocabulary or subject matter. I could go further: I think that adults who scorn the thought of reading Carl Barks, or Lewis Carroll, are most likely stunted in their reading habits generally. I doubt that more than a handful of people in today's publishing industry would agree, and certainly UC Press' performance to date suggests that the people there who control my book's fate are not among them. Because my publisher is stifling awareness of the book, I can't imagine that it will be around for very long. That's a shame; it's a very good book, one I'm proud of, and despite its intimidating price, I can recommend it wholeheartedly to anyone who feels even a middling interest in its subject matter. But don't dawdle too long before you buy it. And speaking of prices: Thad Komorowski calls to my attention amazon.com's offer of an additional 30 percent off print books, an offer good through Sunday, and apparently applicable to pre-orders as well as currently available books. There's a ten-dollar limit, but ten dollars off the price of Funnybooks brings the cost of the book down to a perfectly reasonable figure. Go for it! From Robin Snyder: Steve Ditko and I have worked with large and small publishers, Archie to Fantagraphics and Western and others, and are happiest working for ourselves. We have been publishing on our own for 27 years. The books and newsletters are not as slick and as colorful and as professional as the material we produced for Grosset and Dunlap, Charlton, and the rest but it is ours. The material does not have as wide a circulation and our number of distributors is small compared with the Big Shots, but the rewards are ours to share. No middle man. So, yes, I can imagine how you are feeling and what you are thinking. Yes, I empathize with you. Your essential argument and ideas for promotion make sense to me but suppose those in charge at University of California Press may have their own ideas and prefer those. We once produced a book with a Public Service message. We put together promotional packages for everyone from Paul Harvey and MADD to Nancy Reagan and network news programs. Our publisher got wind of all this, found most of the packages in the mailroom and called me on the carpet to explain what had been done. I showed him. He was very critical, suggested the idea was terrible, might be misunderstood and Barbara Walters might dislike the book and might do a story on our work and hold it up to ridicule. I kid you not, as Jack Paar used to exclaim. I wish you well with your new book. As Goethe might write, There are people whom I wish well, and only wish I could wish better. Don’t tell your prospective audience that the price is steep. Let them make that judgment. Remarking on the price might cause a few readers to move away from you and over to Archie or Marvel. Perhaps one day you will reprint Carl Barks and the Art of the Comic Book. I loaned out my copy and it is on permanent loan to my boy. My son came to visit this week, found the copy of The Animated Man in our Library, and asked about it. I sent him over to Amazon for a copy of his own. We will send our readers after your new book just as soon as possible. MB replies: For those not yet familiar with Robin's work, he publishes a newsletter, The Comics, that is loaded with information you'll find nowhere else—about Western Publishing's New York office and its comics in the sixties and seventies, for instance. Almost every issue includes revealing letters from comic-book veterans. To subscribe, send $30 for twelve issues to Robin Snyder, 3745 Canterbury Lane #81, Bellingham WA 98225-1186. My disappointment with UC Press does not stem from disagreement over how Funnybooks should be promoted. These days, any author (apart from the superstars) knows that he'll have to shoulder the greater part of that load himself, as I did when UC Press published The Animated Man: A Life of Walt Disney in 2007. Back then, the publisher paid for my airline ticket to the Los Angeles Times Festival of Books; I picked up all of my other expenses, hotel and car and meals, and I was fine with that. This time, though, UC Press isn't providing any promotional support at all. To make up for some of that lack, I've ordered copies of the book from amazon.com to be sent directly to a few reviewers who have large audiences and like my work. I flinch at the cost, but I don't know what else to do. My problem with the price is not that it's relatively high—actually, I think the book is worth that much—but that it's of a piece with the complete absence of promotional support. The price speaks to me of a lack of confidence in book, author, and audience. Only a handful of people can be expected to buy this book, its price says to me, and so they must pay a few dollars more than most readers would expect to pay for such a book. What I must emphasize, though, is that Funnybooks itself has turned out very well. It's a remarkable book, if I do say so myself, and I have nothing but praise for the people at UC Press who did so much to make it so. That's why it has been so frustrating to trip over what I can only characterize as hostility and indifference now that the book is finally entering the market. If Carl Barks and the Art of the Comic Book is ever to be reprinted—presumably in a new and corrected edition—that will have to be Mark Lilien's decision, not mine. My contract with him is modeled on my contract with Oxford, and since Lilien has kept the original edition in print, as a hardcover, the rights remain with him. He and I are not in touch, so I have no idea what his plans might be. Actually, I'm cheating. This comic book was published not in the fall but in the summer of 1949, according to the dating code at the bottom of the first page. (That code is "498," or August 1949, but Dell comic books bearing that date were published in late June or early July. I figured that out when I was a kid.) The lead story, illustrated by Roger Armstrong, is a Thanksgiving story for sure, with Porky and Cicero talking faux-Pilgrim talk (lots of thees and thous) and their Indian adversary talking the usual pidgin ("Me choose-um bow an' arrow"). Pretty silly stuff, but it doesn't pretend to be anything more. I have no idea how it wound up being published in mid-summer, but maybe someone missed a deadline. I'm curious if you are familiar with Frank Frazetta's animation art that he created for the various funny animal comics published by Standard/Nedor/Better publications. 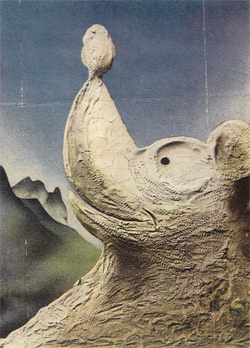 Frank always referred to this work as animation rather than funny animal art. What caused me to query you about this is this piece of Frazetta art that I just added it to my collection. I became a Frazetta fan when I discovered "Dan Brand and Tipi" in Durango Kid Comics when I was thirteen and I began to look for comics featuring his art after that. I was not familiar with his animation art until after I returned to America from Germany and my discharge from the Army in 1962. At that time I had begun to buy comics from Bill Thailing. When he discovered my interest in Frazetta comic art he asked me if I was interested in his funny animal comics; he had tried to interest other Frazetta collectors in it but they weren't interested. I told him that I would buy every Frazetta funny animal comic that he had! I discovered that I really like Frazetta's animation art and, to this day, prefer his comic-book work to his later painting and illustration career. And I am especially drawn to his animation art. During one of my conversations with Frank he told me that he had once been contacted by the Walt Disney Studio, asking him if he would be interested in coming to work for them. I questioned him about when this might have occurred, and he said that it was during the time that he worked for Standard—1947 through 1949. I asked him how Disney had found out about him and he didn't know, except that he said thatone of the other Disney artists who was drawing animation for the Standard funny animal comic books might have showed his work to the people at Disney. I asked him if he had been tempted to accept their invitation and he replied that he was flattered but had no interest in moving to Los Angeles—he would have been nineteen to twenty-one when he was doing the animation art, and he was still living at home, was deeply involved in baseball, at nineteen he had been named Most Valuable Player of the Parade Ground League in Brooklyn with a .487 batting average. Also, he had a girl friend that he didn't want to leave. This page I just added to my collection shows, at the top and middle, the character of Snowman, which he dreamed up in his early teens. He created several booklets of Snowman's adventures; one was adapted by comic-book artist John Giunta. Frank penciled and Giunta inked, and it was published in Tally Ho Comics No. 1, December 1944. The other figures on the page are good examples of his animation art. I feel really lucky to have been able to acquire this page, as originals from this early are quite difficult to find. Frazetta's animation art for comic books has been reprinted in at least two books: Small Wonders (1991) and Frazetta Funny Stuff (2012). Adam Gopnik, a staff writer for The New Yorker, reviews in the November 17 issue a new biography of Bob Hope by Richard Zoglin. I usually enjoy Gopnik's essays, but this one is a little odd. For one thing, he writes about Hope as a movie and TV performer but makes no mention of Hope's career in radio, and it was in radio that Hope's persona, as an aggressive verbal comedian, a joke teller who barely paused for breath, was most distinct. But most relevant here, Gopnik makes a comparison that I immediately rejected. The real parallel to Hope—the great American comedian whose career most closely resembles his—is, of course, Bugs Bunny. Like Hope, he arrived in Hollywood in the late thirties and became a huge star with the war. Like Hope, he was usually paired with a more inward character who loves to sing (Daffy Duck is Bugs’s Bing, though blustery rather than cool), and, like Hope, his appeal rises entirely from the limitless brashness and self-confidence with which he approaches even the most threatening circumstances. Together, they are the highest expression of the smart-aleck sensibility in American laughter. Their fame in wartime may have something to do with the way that, as A. J. Liebling documents, the American Army itself was essentially an urban creature dispatched to deserts and jungles: Bugs, with his Bronx-Brooklyn accent, has somehow been sent out there in the countryside, among the hunters, as Hope ends up in the sands of Morocco with no weapon but street-corner sass. No, no. That "of course" is the giveaway, an attempt to coerce us into embracing a statement that everything we know about Bugs Bunny and Bob Hope implores us to repudiate. Bugs was cool, Crosby was cool; Daffy was hot, Hope was hot. Bugs was Crosby, Daffy was Hope. If, as Gopnik writes, Daffy was "blustery"—and he was that, in the Chuck Jones pairings especially—any comparison with Crosby is immediately disqualified. Perhaps some charitable soul should send Gopnik a DVD of the best Bugs Bunny cartoons and a CD sampling of the Bob Hope radio shows, taking care to include shows that include such audio equivalents of cartoon characters as Jerry Colonna and Vera Vague. Then he might apologize for such a boneheaded comparison. From Bob Fiore: The mind boggles at how wrong-headed that Adam Gopnik quote was. Another way the Bob Hope character is more Daffy-like is that he's a coward. Bugs Bunny always takes control of any situation he finds himself in; Bob Hope always finds himself in situations that spin out of his control. Danny Kaye's comic persona is rather similar to Bob Hope's. Bugs Bunny is more of an inter-species cross-breeding of Brer Rabbit and Jimmy Cagney. And isn't the dominant regional flavor of the United States Army Southern, rather than urban? And wasn't Japan just as urban as the United States? The whole quote seems to be an attempt at cleverness without sufficient thought behind it. From Donald Benson: Equating the two characters certainly doesn't work, but it might be fair to say the broader Termite Terrace ethos does sort of match what Hope and others were doing on radio and at Paramount. The leading exponents of wiseacre and surreal comedy seemed to be clustered at Paramount: Hope, W.C. Fields, Marx Brothers, Mae West, etc. Even Crosby was a bit of a smart aleck beneath his cool. But while it's easy to draw a straight line from Looney Tunes to Paramount—and Paramount's comics—the Warner toons are in fact closer to Warner's live action dramas: tough, scrappy and urban. 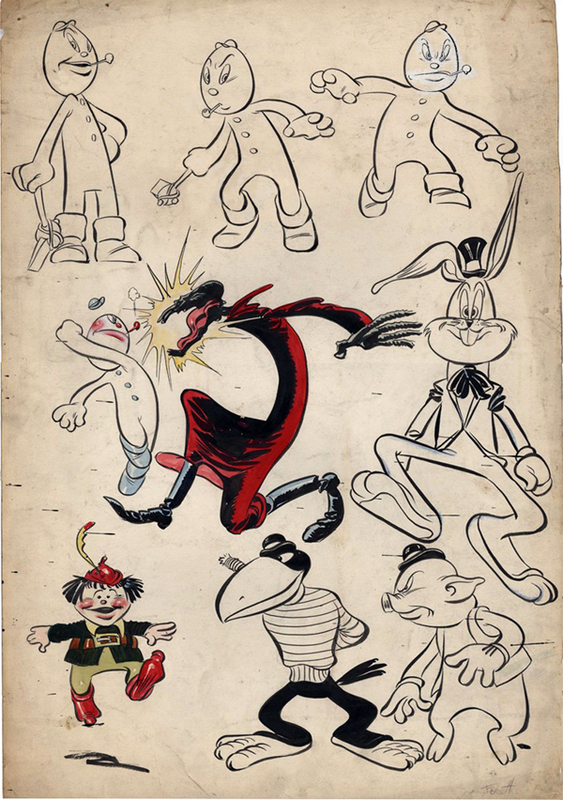 While not a caricature, Bugs may be closer to James Cagney in comic mode than to Bob Hope. Cocky defiance was embraced as a better answer to depression and war than sunny optimism; at least it was more immediately gratifying. That's when Looney Tunes and Hope both took off, and why a Looney Tune goes better with a Road picture than a Noveltoon. 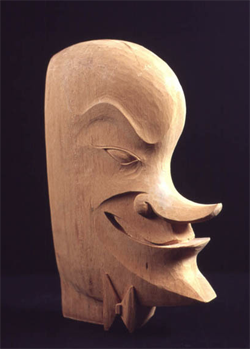 From Garry Apgar: The animated cartoon counterpart for "banana nose" Bob Hope was not, as you say, Bugs Bunny. It was Mickey Mouse. Trust me, I have a nose for these things. Compare these two images: from the Bob Hope Archives (1940s, Library of Congress) and Mickey by Paolo Garretto (Vanity Fair, Sept. 1934). 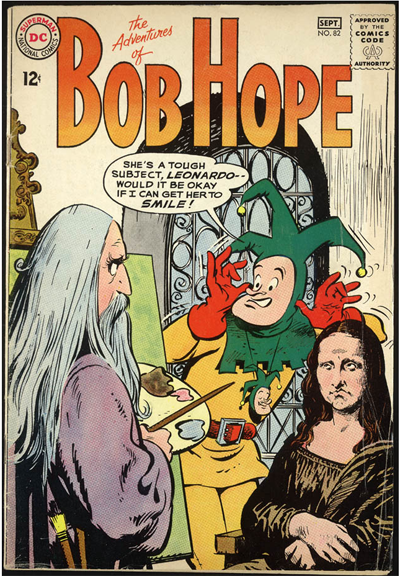 Bob Hope, incidentally, had his own comic book back in the day. See further below. An advance copy of my latest book arrived from the publisher last Wednesday evening, just as I was about to leave on a short wedding-anniversary trip. It looks very good, and I think most people who order it will be very happy with it. Not with the price, maybe, which is a little higher than I would like, but there's nothing I can do about that, and the price is in line with what University of California Press is asking for other books of similar heft. As I've learned, university presses are their own publishing world, a fact with advantages (more care in the production of the book, in everything from copy editing to design) and disadvantages (smaller print runs and correspondingly higher prices). I think that in this case the advantages clearly win. There is considerably more bang for the buck in Funnybooks than in—I started to write, "comparable books," but, in fact, there are no comparable books. Copies should be shipping from amazon.com and other online retailers well before the end of the month, in plenty of time for Christmas. Last summer, Justin Moyer wrote a piece in the Washington Post titled "All That Jazz Isn't All That Great," the gist of which was that jazz was, and is, a greatly overrated art form. It stirred up a lot of comment, most of it hostile. He listed five reasons for his negative judgment on jazz, but the one that I found most interesting was the third, "Jazz Stopped Evolving." Back in ancient times—that is, the early 1960s—when I was a Northwestern undergraduate, I listened to a lot of jazz, along with classical music and folk music (and comedy albums by Lenny Bruce and Tom Lehrer). Sometimes, too, I'd venture into Chicago to hear musicians like Dizzy Gillespie and Herbie Mann at the Birdhouse, a Near North Side jazz club that didn't serve alcohol and so was hospitable to underage college students. Not that I was sophisticated, not at all, but rock 'n roll was still emerging from its larval stage then, and what you listened to and liked a lot in high school—in my case, Buddy Holly and the Everly Brothers—was not yet what you wanted to be identified with in college. 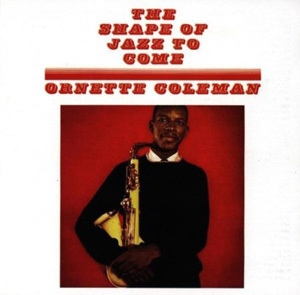 I remember very well when one of my fraternity brothers, who was from L.A. and relatively advanced in his jazz listening, played for some of us an Ornette Coleman LP called "The Shape of Jazz to Come." As Moyer writes, accurately, "Coleman's singular vision ... included atonality, a lack of traditional time signatures and uninhibited solo improvisation." It sounded pretty weird. We all approached Coleman gingerly, but I bought one of his LPs soon after, and more than one LP by another rule-breaker, John Coltrane. I now own boxed sets of CDs by both musicians. I don't play them all that often, but I like having them around. Moyer says, accurately as best I can tell from my limited exposure to today's music, that there's not much difference between the avant-garde jazz I was listening to fifty years ago and the music that avant-garde jazz musicians are playing now. "It's as if jazz, music premised on aesthetic liberation, no longer has anything to push against." Years after I graduated,, I talked about jazz occasionally with my older friend Martin Williams, my collaborator on A Smithsonian Book of Comic-Book Comics and a man widely acknowledged as the very best American jazz critic. I'd found my interest in jazz diminishing after college, and I once asked Martin, what am I missing? His answer was, essentially, that I wasn't missing anything, that jazz had stopped in its tracks. He had assembled a very popular Smithsonian set of jazz LPs, released in 1973, that traced the music's evolution from early in the century up through the sixties. When that set was reissued on CD in 1987, he added only one track, by the World Saxophone Quartet. Martin died in 1992, but I doubt that he would have found much more to admire in later jazz recordings if he had lived longer. There's always the hazard when you write about the arts, the popular arts especially, that you'll either lapse into nostalgia for the good old days or embrace really bad new stuff just because it's new. I think Martin Williams was too intellectually disciplined to fall into either trap, and so I attach considerable weight to his skepticism about latter-day jazz. I don't know that he would have agreed completely with Justin Moyer, but I doubt that he would have disagreed strenuously. I suspect that what is true of jazz has a rough parallel in the state of studio animation, the big difference being, of course, that the fruits of studio animation's stasis are mostly anodyne rather than abrasive. Increasingly, trying to keep up with computer-animated features seems as pointless as following the career of a pseudo-jazz musician like Kenny G. The feature cartoons coming from Pixar, Disney, and DreamWorks Animation—not to mention their lesser competitors—invite comparison not with the great Disney animated features of seventy years ago, but with the "smooth jazz" that is background noise in elevators and doctors' offices. They're that sleek and empty. And so what? It's tempting to search for progress in the trajectory of every art form, and certainly studio animation's trajectory from the twenties on into the fifties can easily be viewed as one of steady and often dramatic change for the better. The Disney shorts of the thirties, the early features, the Warner Bros. and MGM shorts of the forties, even the earliest UPA efforts—it's perfectly reasonable to see in those films a thrilling expansion of the medium's expressive possibilities. That's certainly what I see in them, and that's why I've written books about them. And now, after a long lull that lasted from the fifties through the eighties, it's understandable why those of us who care about studio animation should want to see in computer-animated features, Pixar's especially, a revival of the upward thrust of earlier decades. It's unfortunate that my Kenny G. analogy is more to the point, but there's nothing shameful about that. Other art forms, like jazz, don't fit the steady-progress model any better than animation does. The very idea of progress can be a snare and a delusion. In jazz, in classical music, in modern art, in theater, creative people have often embraced bad new ideas, then tried to find an exit from their mistakes without simply repeating what has already been done by other artists. Less creative people are, of course, only too happy to repeat what they've borrowed from their betters. Maybe that pattern has predominated more in recent years, or maybe it just seems that way, with every success or failure magnified by the huge sums involved. The financial rewards today for successful repetition can be very large indeed, in animation especially, even though the films are almost invariably insipid. I watched Disney's Adventures of Ichabod and Mr. Toad (1949) again recently, in its new Blu-ray incarnation, in preference to a first viewing on streaming video of any number of new CGI features. I didn't give much thought to the possibility that I was wallowing in nostalgia. I knew I was making the same sensible choice that I make when I put Coltrane's "My Favorite Things" in the CD player in preference to just about anything I've heard by contemporary musicians who present their work as "jazz," whether of the Ornette Coleman or Kenny G. variety. But I'm sure there'll come a time when a new CGI feature will draw me to a theater and I will leave that theater happy to have seen something both new and good. Maybe it'll even happen soon, with, say, Big Hero 6. Nah, probably not. But you never know. From Mark Mayerson: I don’t subscribe to the idea that art forms have to progress in order to be interesting. They naturally progress when they’re young as people explore their possibilities. There’s no question that animation evolved into the 1950s or that jazz evolved into the ‘60s. Sometimes, new technology creates progress, whether it is multitrack recording by musicians or the computer in animation. Rather than progress, what I look for is a point of view. I’ve watched many westerns from the 1950s. While there are things that you could identify as progress, such as the treatment of Native Americans or women, what’s really interesting to me is how different creators use the genre to express what’s important to them. There are huge differences in westerns made by Ford, Hawks, Mann, Boetticher De Toth, Dwan and Daves, both in terms of content and style. Different performers like John Wayne, James Stewart, Randolph Scott, Joel McCrea, and Audie Murphy each color their films in individual ways. My issue with current animated features is that the “family film” label has constrained the stories and characters to the point where the best you can say about them from an adult point of view is that they are diverting. Their qualities are superficial. You may laugh or feel excited, but there’s a difference between the film stimulating your emotions and illuminating some aspect of life. The animated films I have enjoyed the most in recent years have been ones that have generally done poorly at the box office, at least compared to the family films. Persepolis, The Illusionist, Mary and Max, The Day of the Crows and the Ghibli films have provided me with more pleasure than almost all of the Hollywood output. Part of that may be due to the different cultural voice. It’s refreshing to see the world from another perspective. While I will admit that the animation in these films does not define character as precisely as the best work from Disney or Warner Bros, the stories and direction compensate for that in my eyes. American animation artists were generally anonymous until historians started to research the field in the 1960s (you especially), but when they did, the contributions of various directors and artists were clear in retrospect. We’re currently in another period of anonymity, but I wonder when historians look back on this period if they’ll be able to discern individual contributions. Possibly designers will stand out, but I wonder if any directors or animators are leaving their stamp on the films. It’s as if Hollywood feature animation has been run through a blender. The differences between studios are minimal, certainly less than Warner Bros. and MGM in the 1930s, and I don’t sense that there are any creative voices as distinctive as the western directors I named above. While I don’t require progress, I have no use for decline. MB replies: I'm sure I'm on well-trodden ground here, but I think there's a very useful distinction between "progress" and "evolution," the one implying improvement that comes with change, the other change alone. Sometimes there's both, as with the Disney cartoons of the thirties, and sometimes there's just change, as with the westerns Mark cites. Presumably Anthony Mann's westerns with James Stewart benefited from the example of John Ford's westerns of a few years earlier, but there's no "progress" involved, only excellence of different kinds. I think Mark is exactly right in finding a distinct point of view lacking in current animated features. Anonymity is the rule of the day, and, as I've argued here, that is undoubtedly to the liking of the studios' proprietors. There has, of course, been one exception to that rule: Brad Bird. That he has for all practical purposes left animation behind, and with no visible effort by his employers at Pixar and Disney to keep him on board, speaks volumes about the state of the industry. From Jessie Smith: You say concerning critic Martin Williams that you "don't know that he would have agreed completely with Justin Moyer's [criticism of jazz], but I doubt that he would have disagreed strenuously." You might be surprised to find that neither do some of these contemporaries—including some of the actual artists, as a matter of fact. The very gifted (and controversial) Houston jazz artist Robert Glasper recently went on record saying, "Jazz has bored me to the point that I wouldn't mind something bad happening. Slapping hurts, but at some point it'll wake you up." He attempted that "slap" with 2012's Black Radio, a lovely fusion of jazz, soul, and rap that, in contrast to jazz's recent lackadaisical state, was brimming over with energy and social commentary. I found it morbidly amusing that it ended up winning a Grammy that year for Best R&B Album, and not Jazz. Troy Rogers (better known as Trombone Shorty out of Louisiana) has also attempted the same sort of musical endeavor in recent years, and his efforts have awarded him appearances on 60 Minutes, but I'm not optimistic about him receiving mainstream exposure that goes further than that. It seems that, apart from the occasional spike every year or two, that jazz as a truly active genre has largely flatlined. It saddens me. MB replies: Jessie is the proprietor of an impressive new website, RapChronicle.com, devoted to that music. Well worth a visit if your interests lie in that direction. No, I'm not thinking about today's elections, which I try to think about as little as possible. Insofar as any piece of writing has a voice, the impersonal, objective voice of the narrative historian is his stock-in-trade. The presumption of factuality underlies the amassed documentation historians live by, and so we accept that voice. It is the voice of authority. But to be conclusively objective is to have no cultural identity, to exist in such existential solitude as to have, in fact, no place in the world. Historians research as many sources as they can, but they decide what is relevant to their enterprise and what isn’t. We should recognize the degree of creativity in this profession that goes beyond intelligent, assiduous scholarship. “There are no facts in themselves,” Nietzche says. “For a fact to exist we must first introduce meaning.” Historiography, like fiction, organizes its data in demonstration of meaning. The cultural matrix in which the historian works will condition his thinking; he will speak for his time and place by the facts he brings to light and the facts he leaves in darkness, the facts he brings into being and the facts that remain unformed, unborn. Recorded history undergoes a constant process of revision, and the process is not just a matter of discovering additional evidence to correct the record. “However remote in time events may seem to be, every historical judgment refers to present needs and situations,” the philosopher and historian Benedetto Croce says in his book History as the Story of Liberty. This is why history has to be written and rewritten from one generation to another. Doctorow's remarks struck me with particular force when I read them again recently, because in researching and writing Funnybooks I brought many facts about the Dell comics to light—you'll learn much more about Walt Kelly, for instance, than you knew before—but I decided to leave many others in darkness, and not simply out of concern for the book's length. The work of any number of artists and writers didn't seem to invite the serious examination that was so rewarding where, say, Carl Barks was concerned. I do write in Funnybooks about Gaylord DuBois and Jesse Marsh, to cite a writer and an artist I've found increasingly impressive and interesting, but I say nothing about the highly prolific writer Paul S. Newman and almost nothing about the artist Tom Gill. I can't associate their names with comic books that I think repay an educated reader's time, comics that are, to use Doctorow's word, relevant. 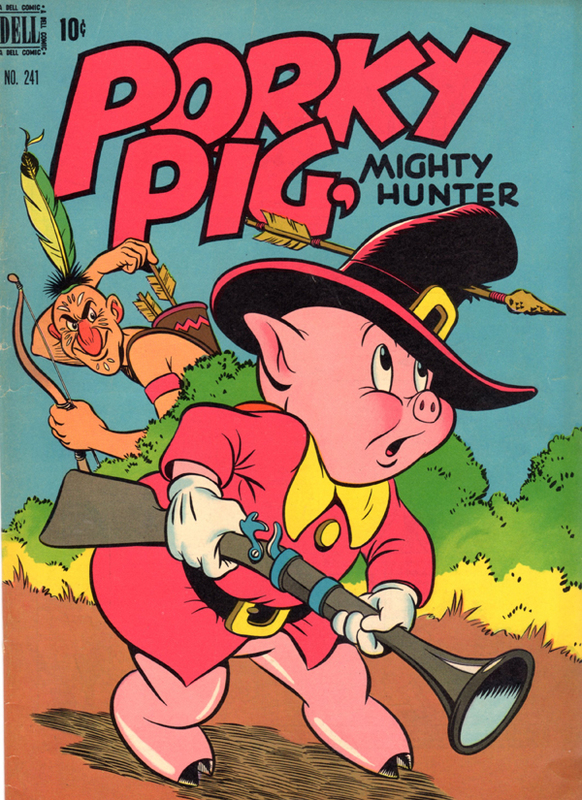 I mention Gil Turner and Harvey Eisenberg, two "funny animal" cartoonists I like, but only in passing. Roger Armstrong, another good "funny animal" man, turns up much more often, but as a reliable witness rather than as a cartoonist whose work invites reading and, especially, re-reading. Other artists and writers filled many pages of the Dell comic books, but without making an impression on me. At least some of those artists and writers made an impression on other people, though, and perhaps, in the "constant process of revision," there will come a time when even, say, Ed Volke will be elevated into the pantheon. Who was Ed Volke? Well, that's sort of the point, isn't it? You'll just have to read the book. Thad Komorowski reminds me that thanks to amazon.com's "look inside" feature, you can read part of Funnybooks online before deciding if you want to spring for the book itself. You can access the preview by either going to amazon's page for the book or through a Google books link. I've posted the second of my two joint interviews with the great Disney animators at this link. 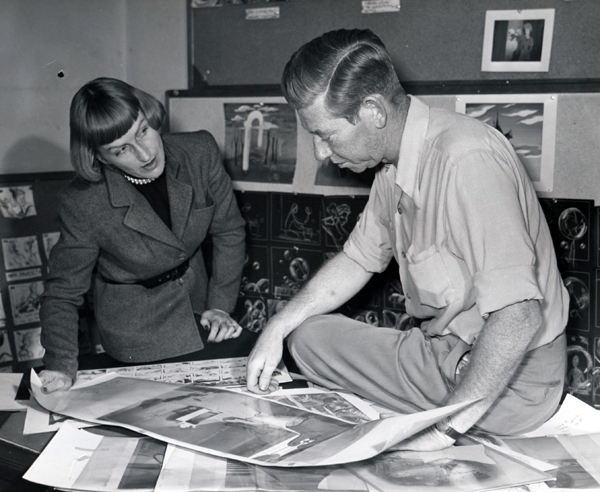 Thomas and Johnston's favorite director, Wilfred Jackson, at work on Cinderella (1950) with Mary Blair, one of several designers (Eyvind Earle was another) whose styling they admired but found problematic. From Don Peri: I just read the two interviews you posted with Frank and Ollie. They are both excellent interviews. I was so impressed with the sharpness of their answers and the analysis they did of their roles at the studio and of relationships at the studio. You and Milt did a great job interviewing them. Thanks so much for sharing them with all of us. I treasure having known Frank and Ollie even more after reading your interviews with them. MB replies: It's especially good to hear from Don Peri because he is himself an esteemed interviewer of Disney veterans. Some of his interviews have been gathered in two books, Working with Walt and Working with Disney, both published by University Press of Mississippi. From Pete Docter: Just had a chance to read your excellent 1987 interview with Frank and Ollie. Thank you for taking the time and labor to transcribe and post it—there’s so much fascinating, clarifying information in there. I was especially interested in the discussions about working with directors; Jackson, Geronimi, Eric Larson, etc. The section about working with Woolie after Walt died was especially interesting. You got some really great information. I eagerly look forward to more of your interviews as you find the time. MB replies: As I've told Pete, it's very gratifying to get such a response from someone like him—he is of course the director of Pixar's Monsters, Inc., and Up—since I get so little feedback on my interviews generally. I've asked him to suggest interviews he'd like to see posted here, and he has suggested Wilfred Jackson and Jack Kinney. Two good choices, and I'll try to oblige in the near future.